In addition to our display on RAAF prisoner-of-war John Osborne, the museum now has a dedicated display case for Second World War POW memorabilia. It mostly looks at the experience of Narromine-born soldier Frank Smith and his brothers. Captured and imprisoned by the Japanese at Singapore’s notorious Changi Gaol in 1942, they were then used as forced labour on the Burma-Siam ‘death’ railway. 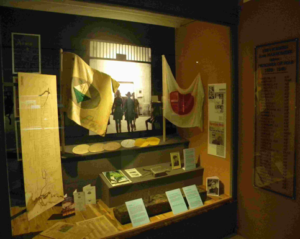 The two flags seen in the photograph are Frank’s 2/20th Battalion flag and a Japanese flag he liberated from Changi. Also displayed is the pannikin (meal tin) used at Changi by Cliff Whitelocke, owner and editor of Narromine News from the 1930s to the 70s. Although Cliff, Frank and his brothers served in the army, a pre-war joyflight which Frank had taken at Narromine in the historic Avro airliner Faith in Australia had inspired him to initially apply for air force service. Cliff, through his newspaper columns, was a great advocate for local aviation. Displayed on the wall at right in the photo is the nominal roll of 35 men from Narromine who were imprisoned in German or Japanese POW camps during the war. Three were RAAF pilots. This entry was posted in Newsletter 2016. Bookmark the permalink.